Are you one of those people who goes out to a restaurant and has great ideas over dinner? You scribble them down on a napkin, or the back of your receipt and then stuff it into your wallet or a coat pocket and never seem to get back to it? Or if you do get back to it, some important part of it always seems to be missing? If you can relate to this, Evernote was created for you. 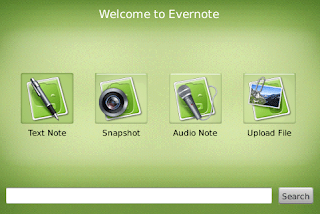 Evernote is a free service provided by the Evernote Corporation. It allows you to capture, organize, and reference your notes, pictures, web clippings, and more. And you can do it from their web interface at http://www.evernote.com, or by downloading a client. Currently clients are available for Mac OS X, Windows, the iPhone, the iPad, Android, Blackberry, the Palm Pre or Palm Pixi, and for Windows Mobile. Once you’ve created your free account, your notes will sync to each client as it connects to Evernote’s servers. The number of notes you can have is unlimited, but with a free account, you’re limited to uploading 40MB of notes per month. Evernote also offers a Premium account for $5 a month or $45 a year that increases your upload limit to 500MB a month and provides additional extra functions. Getting started with Evernote is just a matter of creating a username and password and providing Evernote with a valid e-mail address. Evernote will send you a confirmation e-mail. Verify that you did create the account, then sign in with your new account, or download and install one or more clients. You’re ready to start capturing your notes. Simple. There are a lot of ways to get something into Evernote. The most obvious is to use one of the clients to create new text notes, or take a snapshot directly into Evernote from the client. In my experience with my iPhone, taking photos directly to Evernote was always an iffy proposition. I’ve lost pictures because the upload never completed, or a phone call came in during the upload, or because the client app just popped. Much safer to take the picture to your phone’s cameral roll, and then upload it from there to Evernote. And on some devices you can also take voice notes as well. 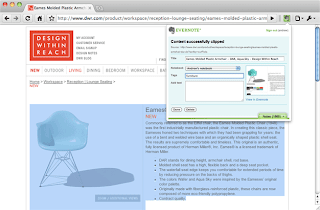 The Windows and Mac clients also install an Evernote web clipping tool. You can also download and install versions of the tool for various browsers on those machines where you don’t want to have a full browser, but use often enough to want to be able to capture web clippings. 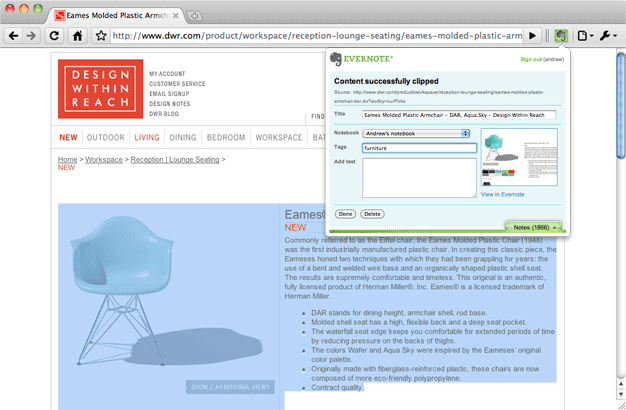 Once the tool is installed, just click on it to send an entire page to Evernote. If you only want a portion of a web page, just select the area you want first. Evernote has a few other ways of allowing you to import information. With each account you get an e-mail address that allows you to send or forward e-mail right into Evernote. So when you get that hotel conformation letter you can forward it and have it in Evernote where you can find it quickly. More on finding things later. If you start getting spam at that address filling up your Evernote, just go into settings on the web client and generate a new e-mail address for your Evernote account. In addition to e-mail, you can drop Twitter messages into your evernote account. Just follow @myen (My Evernote), and you will receive a direct message with a confirmation link. Click on that link and sign into Evernote to associate your Twitter account with your Evernote account. Then, if you tweet or retweet anything with @myen in it, that tweet will go right into your account. Evernote will also import your Google Notebook items as notes. To do this one you’ll need to sign in to the web client and go into settings. Click on the Import tab item, then click on Google Notebook. There is an instructional video, and detailed instructions to help you choose the import settings you want. 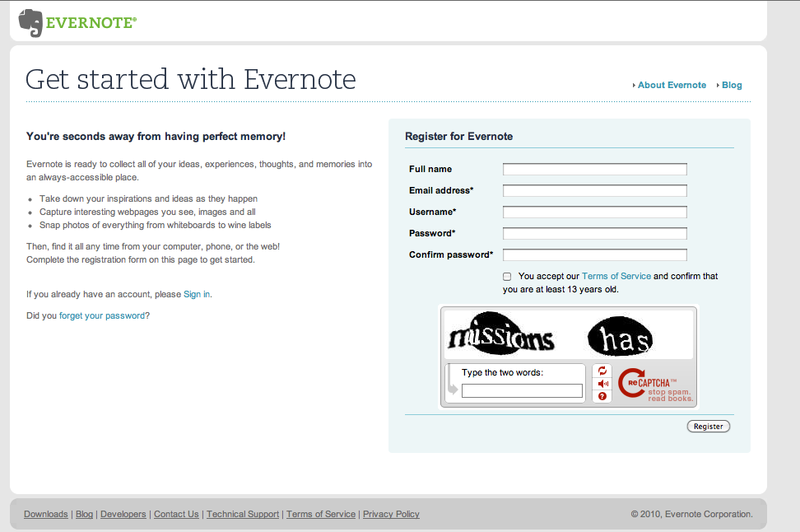 Presumably, Evernote will be expanding the number of services that you can import from in the near future. Some products are even building in Evernote compatibility. 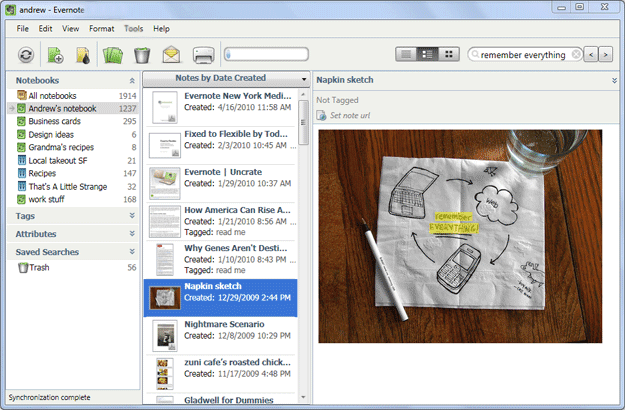 For example, the Cannon ImageFormula P-150 will scan documents and upload them directly to your Evernote account. The Eye-Fi wireless SD card can send pictures directly from your digital camera to your Evernote account. Mobile applications like Seesmic and Egretlist will also sync content to your Evernote account. You can find a list of similar products on Evernote’s website. My search word is even highlighted in the picture. 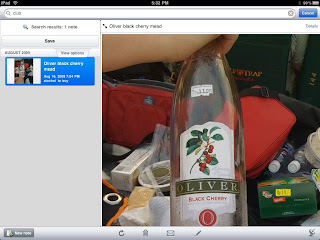 Evernote doesn’t keep an OCR copy of your image to search, and you can’t get an OCR version of a photo out of Evernote. Instead it keeps a list of possible text interpretations with different scores. This lets you search for text in images without having to look at each image. It isn’t perfect, but it does give you a best guess. 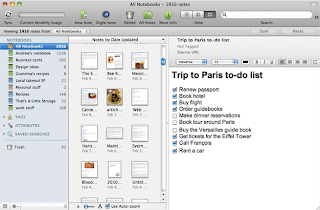 Evernote lets you organize your notes in two basic ways. The first is that you can assign tags to your notes. Tags can be anything you want, providing it is meaningful to you. They let you pull similar data from across your list of notes. The second method is to group related data items into notebooks. Notebooks pretty much work like folders, except you cannot nest them. So, if you were a frequent traveller, you could create a notebook for each trip and add all the planning information for your trip into that notebook. You could then tag your hotel confirmation as “Hotel”, your rental car reservations as “Rental Car”, your plane tickets as “Flights”, and your schedule as “Itinerary”. Then when you need to find something, you can either look it up by the trip, or by the type of information it is. 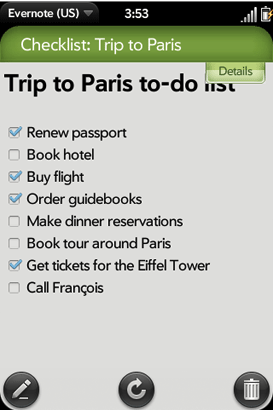 Or you could create notebooks for “Hotel”, “Rental Car”, et al and tag the items by the date and destination of the trip. Whatever makes sense to you. One thing to be careful of when creating notebooks, is the kind of notebook. Notebooks can be either synced or local, and once created the type cannot be changed. You don’t want to put data you need to take with you into a local notebook. 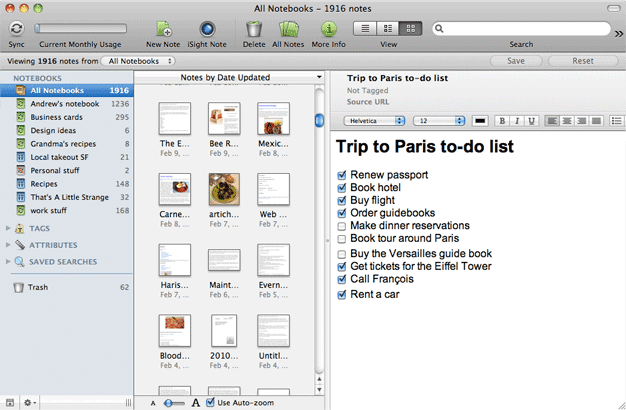 One of the nifty things that you can do with Evernote is to share your synced notebooks with others. Either you can share the notebook with the world, or you can share it with specific individuals. Evernote actually implements their website FAQ as a series of shared Evernote notes. You can search it, or browse through the notes. And you can link individual notes, or groups of notes from searches to your account so that you can pull up that help at need. When you share a notebook with the world, it becomes available at a public url that begins with www.evernote.com/pub/ and your username. At the next level down, you get to set the name the world will see and add a description. You can also determine the sort order of the items in the folder. When sharing with individuals, you will need to provide the e-mail addresses of the individuals and determine if you wish to require them to log into Evernote in order to access the notebook. You can also include an explanatory message to go along with the invite. With a free account or when sharing to the world, you can only share files as read-only items, but with a Premium account you can choose to give your invitees privileges to edit the notebook and add or delete notes. 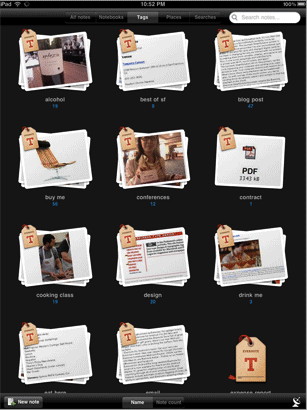 With the free account the kind of files you can place in a note are limited to text, images, audio, and PDF files. And that is really enough for most people’s needs. But if you need more, you can try a Premium account, which will allow you to upload any file type. It also allows you to search within PDF files, access note history, and maintain local notebooks on an iPhone or iPad. I haven’t tried the Premium account yet, so I can’t vouch for these features. With the Premium account, the maximum size of an individual note is bumped up to 50 MB from 25, and the user gains the ability to turn off the advertisements that are displayed on the Evernote web site and in the client. The ads aren’t particularly offensive, but they do take up screen space. 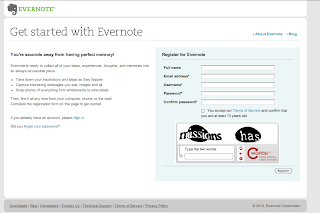 Regular Evernote accounts are secured by the logon information, which is transmitted to the server using SSL, while the actual notes are transmitted in the clear. With a Premium account, your entire session is encrypted with SSL instead of just the logon info. If you’re wanting to store just a few notes with sensitive information, you can encrypt just those notes using the windows client for Evernote. Unfortunately these encryption tools haven’t been built into the other clients yet. And remember that encryption key, because you will have to type it in whenever you want to access any encrypted notes. The big power of Evernote is the sync. The fact that you can collect your notes anywhere you happen to be, right when the thought hits you, then organize them when you have time, and carry the finished product on your mobile device, or access it through the web. Even if you’re in an area with no network connection, you can add and edit notes and then sync the changes when you can connect again. The best part, however, is the fact that the guys at Evernote aren’t sitting back on their laurels. They’re still working to improve and expand Evernote to provide new tools to capture, organize, and retrieve your notes. It will be interesting to see what they add next. Interesting. Have you actually run into this 100,000 note restriction, Doug? My research didn’t turn up anything about this. I’ll admit that I haven’t created quite that many notes yet. How did you find out about this limit? I’ll agree that they shouldn’t advertise it as unlimited if there is a finite limit and they don’t intend to fix the problem. But if they are intending to fix the limit, I’ll cut them some slack. Of course at this point I’ve not heard one way or the other. Still, something does need to be fixed. Thanks for telling me about this. Hopefully the Evernote folks will take notice and address the issue. Interesting. At the time I originally published this review, almost four years ago. Evernote was touting unlimited notes. I see now that they’ve but a 100,000 note cap on the total number of notes for personal and premium users, although they still say they have unlimited storage. That is a lot of notes, and for most people, it is more than enough, but it isn’t exactly unlimited. Thanks for pointing that out. For some people, that limit may make the difference between using Evernote or something else. Previous post: #FollowFriday – @BooksAndBraun: Steampunk Adventurers!